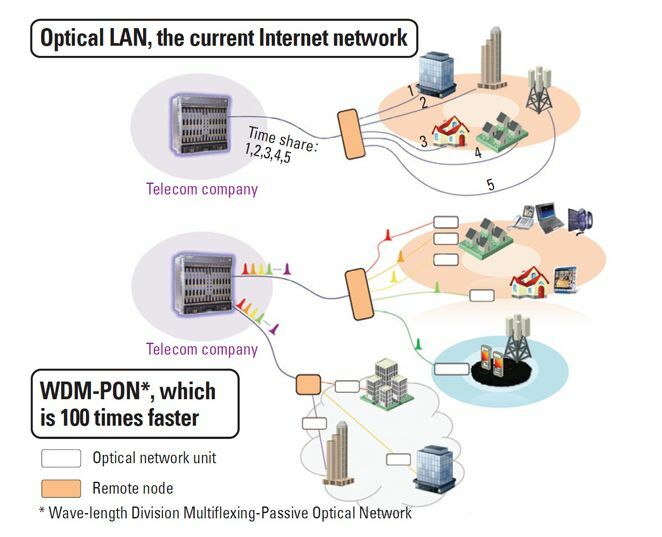 As reported in The Korea Joongang Daily, commercial internet speeds are about to jump 100-fold next year. 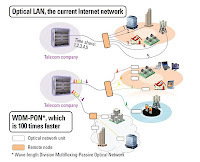 As illustrated in the accompanying diagram, (click to see a full size version) this increase in speed will come with the introduction of a newly developed network called the Wavelength Division Multiplexed Passive Optical Network (WDM-PON). Not surprisingly, this technical advance was announced by the state-run Electronics and Telecommunications Research Institute (ETRI). The director of ETRI's optical access research team noted that this new network would offer the highest internet speed available anywhere in the world. “Such technology can send 10 gigabytes of data per second,” he noted. Current Internet networks can only send 100 megabytes per second, meaning they are 100 times slower. One byte is equal to eight bytes. Readers of this blog will know my view on the importance of speed in next generation broadband networks. See for example my post in February of this year.